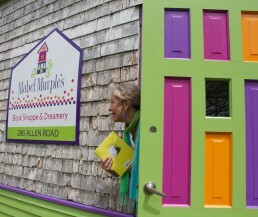 Mabel Murple's World – Read! Dream! Write! Imagine! We will be closed for the week starting Wed Aug 15th. We will re-open Wed Aug, 22 for last two weeks of our season. Please share. Prayers for all affected by tragedy in Fredericton N.B. Words, whimsy, wonder for all ages. “As long as we have stories we will never be alone” –S.F. in an old granary & he did! on those shelves — who knows? We do know you’ll find..
Come inside : think outside of the box …. Store!